In a completely non-churchy, frivolous post, I had to share this with you. My head is reeling with the story, and I’m amused that a piece of “creative” fiction I wrote doesn’t seem as far-fetched as I once thought. First, the news item, via the BBC. 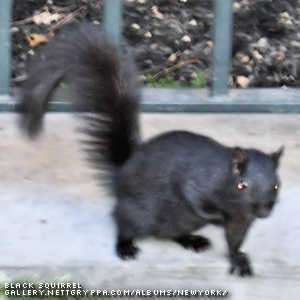 Last Thursday, a pack of hungry, killer squirrels (yes, that’s right — squirrels) descended from from on high to terminate with extreme prejudice a stray dog. The stray was, admittedly, annoying the hungry squirrels: loitering around their tree, barking at them with short-lived temerity. When the black squirrels finally had enough, they swarmed down the tree like ninja rodents, attacked the dog and literally eviscerated him. Next, a couple years ago, I was a member of a small ceative writing group at Christianity Today. One of our assignments required creating “hook” paragraphs to grab a reader’s attention and pull them in for a longer story. One hook I submitted (shown below) got a chuckle. Please, enjoy my little exercise in fun. And … remember …. Life is more creative than fiction. God enrolled me in a new class on humility yesterday. My schoomaster was a rodent. As it happens, a delightful little neighbor moved into our backyard recently: A cute little albino squirrel. Sitting at our kitchen table, we’ve all admired his acrobatic prowess, twitchy grace, and near-paranoid awareness of his surroundings. The next thirty seconds were a blur. When it was over, the pocket from my jeans was missing, as were — in fact — my pants themselves. I found myself bleeding from my right hand, the lobe on my right ear was nearly bitten off, and I had claw marks running from the side of my face to the top of my head where the “cute” squirrel finally launched itself over the wall. With my pants. Turns out I was the “nut” the squirrel ate. Somewhere, in the distance, I can hear my daughter’s screams. Rich is alive and typing! I was starting to wonder if a pack of hungry killer squirrels had gotten to you. Squirrels are just rats with bushy tails, as far as I’m concerned. I would like to rent the pack of killer squirrels for a day, as I have a yappy dog next door in need of evisceration. Now, for urban mongrel evisceration you need the Soviet Spetznaz ferrets. Not only are they trained in covert and battlefield operations, being boneless they can slip through literally any crack and under any garage door. Everyone knows squirrels are tiny minions of the Anti-Christ. “Beware thou the vermin with bushy tails for they shall entice thee with puffery and foolery. And whilst thou dost smirk at their frivolity they surely despise thee and will verily rob thee of thine dignity. I tried looking this up on Bible Gateway, but it can’t seem to find it. It may be apocryphal of course, but I suspect Origen may have had a hand in revisionistic redaction. Everybody knows he was squirrely. It’s in the book of Enoch, Silly. Your postings have been so sporadic of late that I was beginning to wonder what had become of you. Just trying to find gainful work, Oengus. That’s all. Between that and the odd freelance job here and there, and my computer breaking down and having to do a complete system restore, I just haven’t had much time (or heart) to blog.